Bed bugs continue to be a top concern for homeowners. They are a pest that will most likely send homeowners right to the phone to call for a professional if an infestation is suspected. While a different tempo than the bed bug boom of 2010-2012, there remains a steady buzz about bed bugs in the news media and their prevalence is reported throughout the country. The Professional Pest Management Alliance (PPMA) continues to execute marketing campaigns on the topic of bed bug awareness and the importance of working with a pest control professional. PPMA went right to the source and asked pest professionals battling bed bugs about what they’ve seen over the past year and how the landscape of bed bug work has changed. The group conducts this survey every few years to track growth and trends since its first Bugs Without Borders study in 2010. The main objectives of this research were to identify characteristics of bed bug infestations, including location, seasonality and warning signs; to determine key statistics to share in marketing communications materials about bed bugs; and to understand what areas pest control professionals would like their customers to focus on to help control infestations. 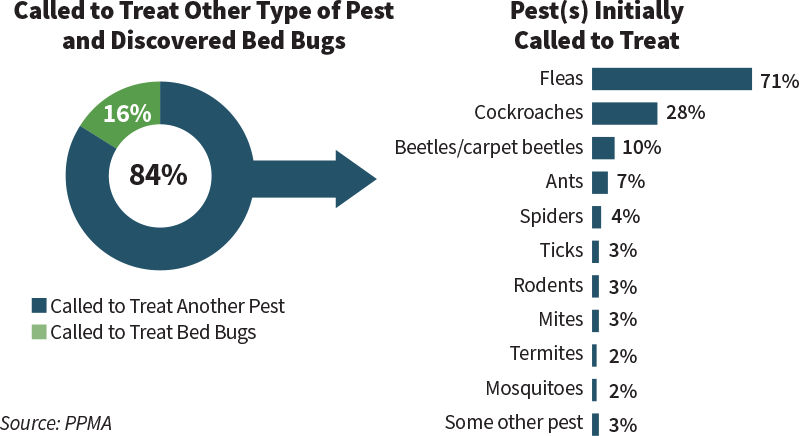 The research also found that customers commonly mistake bed bugs for other pests; most people won’t pick up the phone until they have actually been bitten; and that bed bugs can be found in unusual places. Here PPMA shares key findings and suggestions for how firms can apply them to future bed bug-related marketing efforts. Q: What’s the current state of bed bug service work? A: A whopping 97 percent of pest control professionals who were surveyed indicated that they have treated for bed bugs in the past year and 69 percent said that the prevalence and overall bed bug service work is increasing. 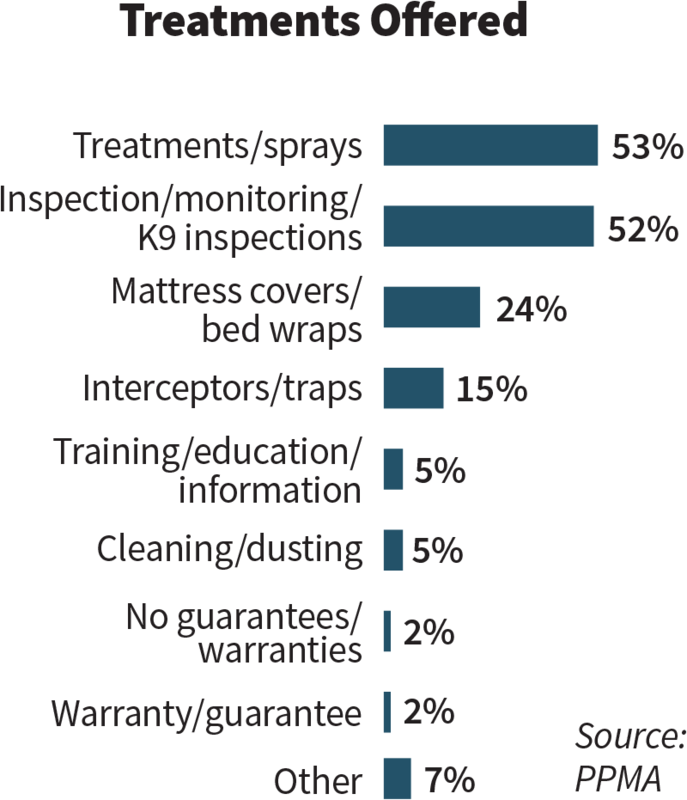 The majority believe that bed bugs (62 percent) are the most difficult pests to control. Other pests on that list include ants (21 percent), cockroaches (12 percent), rodents (9 percent) and termites (3 percent). 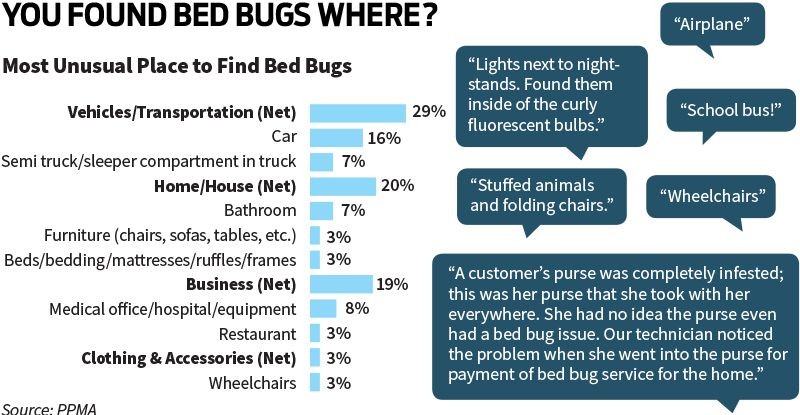 Q: Where are bed bugs being found? A: The findings provide proof that bed bugs can be found virtually anywhere people gather. The top three places where PMPs found bed bugs over the past year include single-family homes (91 percent), apartments/condos (89 percent) and hotels/motels (68 percent). Respondents reported that rooms containing upholstered and wooden furniture, such as couches, bed frames and mattresses, provide more areas for harboring bed bugs. When asked about service work in single-family homes and what rooms or areas of the house bed bugs were found most often, respondents listed the master bedroom (97 percent), living room/family room (88 percent) and children’s bedrooms (83 percent) as the top three. Q: What time of year are these blood-suckers most active? 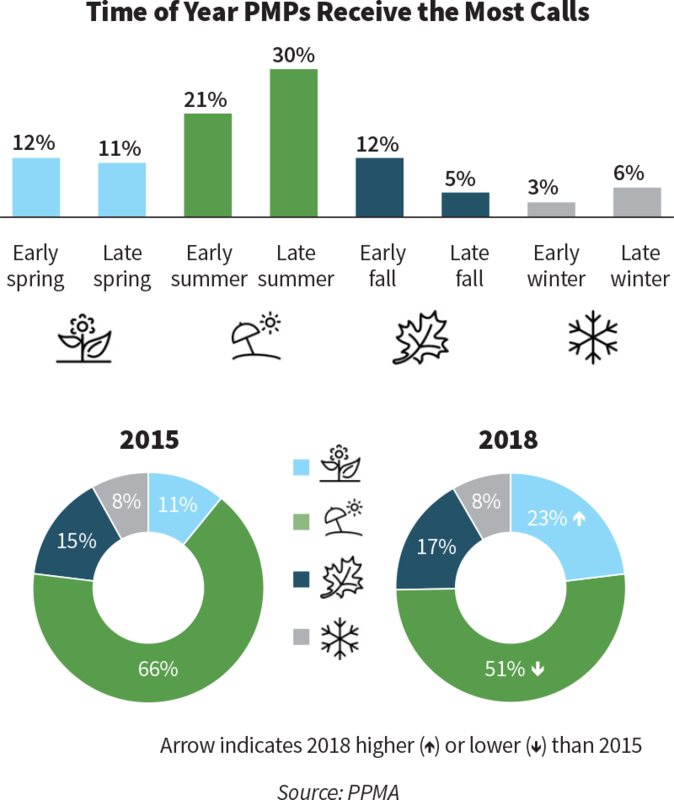 A: As far as seasonality goes, respondents report that bed bugs tend to be most active during warmer months, especially summer (51 percent) — with slightly more service calls taking place later in the season. Since summer is a popular time for vacations and travel, it is no surprise that these hitchhikers turn up more then. Q: How concerned are customers? A: Respondents were in agreement that customers have become more concerned about bed bugs. But, when will they take action? Bites are the most commonly reported sign of a bed bug infestation. More than half (55 percent) of pest control professional reported that their customers first reach out for treatment after noticing bites or welts on their bodies. Other incidents that make customers pick up the phone include the first sighting of a bed bug (22 percent) or an infestation becoming severe (19 percent). Three percent will call after a failed do-it-yourself treatment. Q: Can consumers ID a bed bug? A: Most bed bug discoveries are a result of pest control professionals initially being called to treat other types of pests. In fact, 84 percent of pest control professionals were called in to treat another type of pest only to discover it was actually bed bugs. The most common doppelganger? Fleas, as reported by 71 percent of respondents. Q: What’s the landscape for proactive treatment look like? A: Since 2015, fewer pest control companies are offering preventative services (54 percent of respondents reported they offered preventive services — down from 77 percent in 2015), which could stem from the low number (25 percent) of customers who are interested in this service. On average, the majority of calls for preventive services come from hotels/motels, apartments/condos and single-family homes. A: PPMA pursued a line of questioning about how commercial properties handle bed bug infestations. The team asked who is typically contacting the pest control company first when it comes to treating bed bugs for a customer in various multi-unit complexes. Research found that in the majority of commercial settings (shelters, hotels/motels, nursing homes, libraries, public transportation, etc.) the landlord is almost always responsible for making the initial contact. While most commercial locations seem to have isolated incidents, it is fairly common to find bed bugs in adjoining rooms in shelters, apartments/condos and college dorms. Q: What do companies wish all customers would do to make the bed bug treatment process easier? Educate your customers. The research shows that the prevalence of bed bugs continues to be an issue in many parts of the country. Education is key when it comes to communicating with your customers and prospects about bed bugs. Share information about how to identify a bed bug, signs of an infestation, statistics from recent research, a checklist for customers to better assist your team with eradicating an infestation — and the list goes on. This can be done through website content, social media posts, brochures/direct mail pieces, conversations during home appointments and through working with the local media. In 2019, consider joining PPMA for a marketing push during Bed Bug Awareness Week (June 2-8, 2019). PPMA investors will have access to an exclusive marketing toolkit containing ready-to-use materials, including a customizable press release, suggested social media posts, Facebook and Twitter cover photos and more. PPMA commissioned MARC, a third-party market research firm, to conduct a survey among pest control providers to understand the landscape of bed bug infestations and treatments. A total of 244 online interviews were conducted from April 30-May 11, 2018. Qualified respondents included those whose primary focus of business is pest control and who have treated bed bugs within the past year. Results trended back to previous studies conducted by PPMA in partnership with the University of Kentucky. Variance in sample makeup and data collection could influence differences between years. Totals may not add up to 100% due to rounding. Strike while the iron is hot. If bed bugs make the news for infesting a local movie theater or a college dorm is reportedly overrun, pick up the phone and offer your insight and expertise to the media. Offer yourself as a local bed bug expert and provide any additional information that isn’t included in the article about bed bugs, such as prevention tips, signs of an infestation, multimedia assets to complement their piece, etc. Regularly talking with local media and building up these relationships will get them to think of you for future bed bug (or other pest-related) stories where they may need a resource. This is also good content to post on social media, in a customer newsletter or on the company website (or blog) with any additional tips or advice your company can share. Timing is everything. Plan to share relevant content with customers and prospects leading up to and during peak bed bug season (summer) and around big travel weekends like Memorial Day, Fourth of July and Labor Day. If you’re active on social media, consider dedicating a few posts a week toward the end of spring and throughout the summer to talk to your followers about bed bugs. Share bed bug visuals and video, a story about an unusual place that you may have just treated for bed bugs, links to your website with more information about these blood-sucking pests, etc. Talk to customers during scheduled appointments about the importance of bed bug prevention and consider bringing a bed bug brochure along with tips to prevent encounters during vacations. FINAL THOUGHTS. PPMA’s 2018 Bugs Without Borders research is a reminder that customers and prospects need ongoing education when it comes to bed bugs. There are several ways that bed bug education can come through in already implemented marketing efforts, and plenty of opportunities for companies to get out and talk about bed bug prevention more frequently. 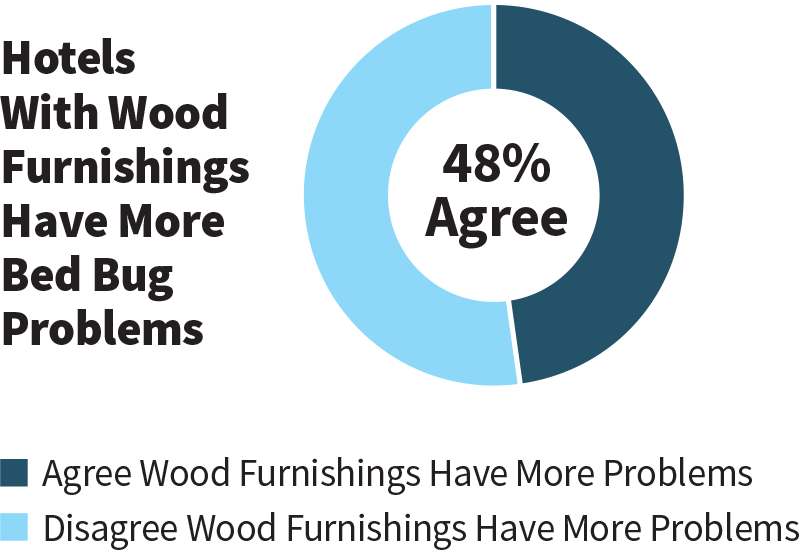 For more information about PPMA and how to purchase the full research study, contact cmannes@pestworld.org.